I’ve used this simple recipe most recently for my prune flan and also mock apricot flan but it would be as suitable for a savoury dish..
Sift 6 oz of self-raising flour (or plain flour with a teaspoon of baking powder) with a pinch of salt. Rub in 2-3 oz of cooking fat and then add in 2 oz of rolled oats. 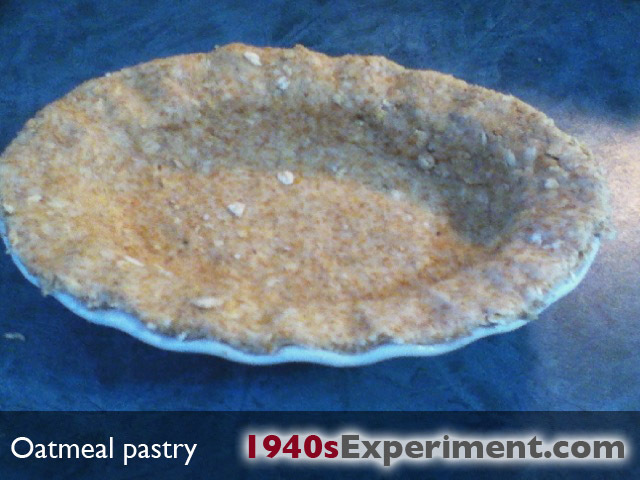 This entry was posted in Uncategorized and tagged oatmeal pastry wartime recipes. Bookmark the permalink. Also, this be for an 8″ crust, right? And would 375 degrees be considered “moderate” for the temp, how long for cooking the crust? Sorry, I’m still a beginner with pastry!